If you can answer yes to the following questions you'll want to get your hands on the Fast Path To Traffic For Beginners Crash Course Package! 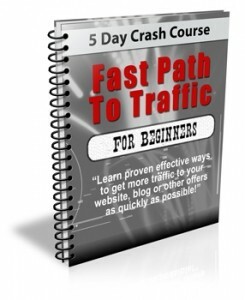 The "Fast Path To Traffic" crash course was specifically designed to show even absolute beginners how to get more traffic to their website, blog or any other page they choose. Even if your customers have never thought about getting more traffic as a part of their business plan before they will quickly understand how they can use free and paid sources to get unlimited amounts of site traffic! The best part is with the private label rights to this course not only will you be able to learn the ins and outs of getting more traffic to your own website, you will be able to pass that knowledge on to your customers and subscribers. You will be providing them with quality information that will help them understand how to use free and paid methods to generate as much traffic as they want!